Division of whole numbers is discussed here step by step. 1. Division is repeated subtraction. (i) 50 - 10 = 40. 2. Division is the inverse of multiplication. 3. 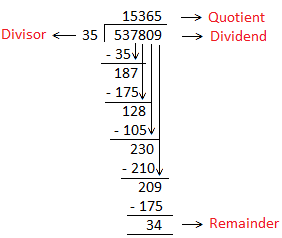 Relation between Dividend, Divisor, Quotient and Remainder is. 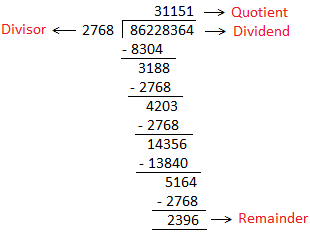 (a) Divide 537809 by 35 and find the quotient and remainder. We need to divide the dividend i.e. 537809 by the divisor i.e. 35 to get the quotient and remainder. 5 cannot be divided by 35 as 5 < 35. So, we will move to the next digit of the dividend i.e. 3 and now we have 53 which can be divided by 35 as 53 > 35. We first divide 53 by 35. 35 into 53 is 1 leaving 18. Then we bring down the next digit of the dividend i.e. 7 and we have 187. Now we divide 187 by 35 so, 35 into 187 is 5 leaving 12. Again we bring down the next digit of the dividend i.e. 8 and we have 128. Now we divide 128 by 35 so, 35 into 128 is 3 leaving 23. Similarly, again we bring down the next digit of the dividend i.e. 0 and we have 230. Now we divide 230 by 35 so, 35 into 230 is 6 leaving 20. And at last we bring down the last digit of the dividend i.e. 9 and we have 209. So, we divide 209 by 35 then, 35 into 209 is 5 leaving 34. (b) Divide 86228364 by 2768 and check the answer. We need to divide the dividend i.e. 86228364 by the divisor i.e. 2768 to get the quotient and remainder. 8 cannot be divided by 2768 as 8 < 2768. So, we will move to the second digit of the dividend i.e. 6 and now we have 86 which cannot be divided by 2768 as 86 < 2768. So, we will move to the third digit of the dividend i.e. 2 and now we have 862 which also cannot be divided by 2768 as 862 < 2768. So, we will move to the fourth digit of the dividend i.e. 2 and now we have 8622 which can be divided by 2768 as 8622 > 2768. We first divide 8622 by 2768. 2768 into 8622 is 3 leaving 318. Then we bring down the fifth digit of the dividend i.e. 8 and we have 3188. Now we divide 3188 by 2768 so, 2768 into 3188 is 1 leaving 420. Again we bring down the sixth digit of the dividend i.e. 3 and we have 4203. Now we divide 4203 by 2768 so, 2768 into 4203 is 1 leaving 1435. Similarly, again we bring down the seventh digit of the dividend i.e. 6 and we have 14356. Now we divide 14356 by 2768 so, 2768 into 14356 is 5 leaving 516. And at last we bring down the last digit of the dividend i.e. 4 and we have 5164. So, we divide 5164 by 2768 then, 2768 into 5164 is 1 leaving 2396.